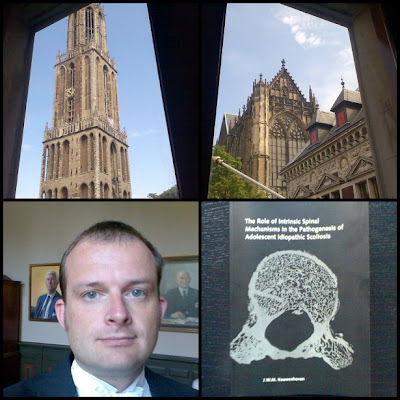 My brother's PhD thesis: The role of intrinsic spinal mechanisms in the pathogenesis of adolescent idiopathic scoliosis, Jan-Willem Kouwenhoven MD. The Relation Between Organ Anatomy and Pre-existent Vertebral Rotation in the Normal Spine: Magnetic Resonance Imaging Study in Humans With Situs Inversus Totalis. Analysis of Preexistent Vertebral Rotation in the Normal Quadruped Spine. Analysis of Preexistent Vertebral Rotation in the Normal Spine. Spinal Decompensation in Neuromuscular Disease. Geweldig! Gefeliciteerd! Uit het VUmc.